Over the next 25 years, outdoor water use will be a major factor in escalating water demand in California. The demand will be aggravated by the dominant land-use pattern in inland areas: single-family homes with lush lawns. Without efforts aimed specifically at reducing outdoor urban water use, the demand will pose significant financial and environmental challenges for California. 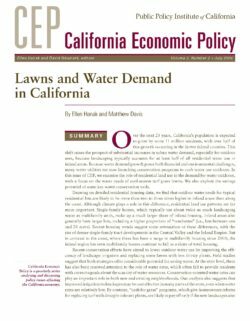 In this issue of CEP, the authors analyze population growth and housing trends in the state’s major climactic regions, estimate residential lot and yard sizes, and examine the water needs of cool-season turf grass lawns. They also evaluate several outdoor water conservation programs.